Hiring managers form first impressions about you in a matter of seconds. Your dress, grooming, facial expression, the way you enter the room and your handshake all contribute to this impression. The first impression can affect an interviewer’s attitude toward you throughout the evaluation process. If he feels positive toward you upon first look, he likely will listen with a higher expectation of your abilities. If he is immediately turned off by your appearance, you will have to work hard to overcome this during your interview. Results of many studies support this notion. A Yale University study found that better looking workers earn around $230,000 more than those considered to be less attractive. Meanwhile, a survey made by Newsweek on 202 corporate hiring managers showed that 57% of those who participated were more partial to better looking candidates with the same qualifications as the other candidates. 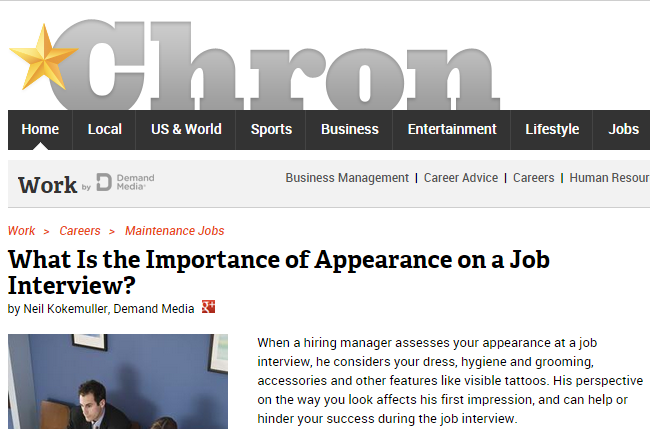 The same survey showed that hiring managers put a higher premium on appearance than other factors, like the school where a person graduated from. Many other sources, including economists and management experts, concur that appearance play a large role in enhancing one’s chances of advancing in the workplace. Given these facts, it would be safe to say that good looking jobseekers in Baltimore stand a better chance of getting employed than the rest of the field. It is not surprising to learn, therefore, that many people seek the services of a plastic surgeon in Baltimore and elsewhere to be competitive in the workplace, as revealed by the American Society of Plastic Surgery and the American Society of Aesthetic Plastic Surgeons. The procedures available to candidates include surgical ones, such as rhinoplasty (nose surgery) and facelifts. However, minimally invasive procedures, such as Botox and Laser Skin Resurfacing, are gaining popularity because of their convenience and fast results. The Newsweek survey leaves one other interesting detail that jobseekers should keep in mind: majority of hiring managers cited “confidence” as the first trait they look for in a candidate. A number of studies have pointed to the positive effects plastic surgery has on the confidence and self-esteem of patients. Those seeking to improve their self-image can consult Baltimore plastic surgeons, like Jeffrey E. Schreiber, MD of the Baltimore Plastic and Cosmetic Surgery Center, about the procedures that would be appropriate for their aesthetic goals, and give them the confidence they need in establishing their careers.